In Chapter 2, we introduced a series of examples of how cartography selects and depicts terrestrial, celestial, and human biological features of physical phenomena. Geographic and oceanographic maps help us to find our way on land and sea. Star maps help us to explore the universe. In this chapter, we turn our attention inwards and explore the design of mind maps, maps that represent our thought, our experience, and our knowledge. In traditional cartography, a thematic map always has a base map and a thematic overlay. For many physical phenomena, a geographic map is probably the best base map we may ever have: intuitive, solid, and real. Now we want to produce a map of the mind. In this category of phenomena, a geographic connection may no longer be valid. A geographic base map cannot be taken for granted. What metaphor do we use to hold something as fluid as our thought together? What are the design principles in constructing a metaphoric base map that can adequately represent what is by its nature invisible, intangible, and intractable? Chapter 3 [...] extends the metaphors established in Chapter 2 to conceptual worlds. 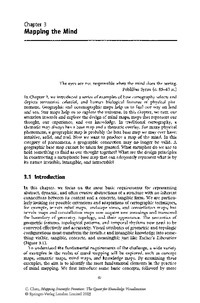 On the one hand, the uniqueness of mapping conceptual systems is distinguished. On the other hand, the intention was to consolidate design strategies and visual representations that can be carried through into the new realm. Memory palaces, for example, echo the constellation figures described in Chapter 2. This chapter also introduces some of the most commonly used methods to derive visual-spatial models of concepts and people's opinions. Examples in this chapter demonstrate not only the use of classic multivariate analysis methods such as multidimensional scaling (MDS) and principal component analysis (PCA), but also the promising route for further advances in non-linear multidimensional scaling. The sizzling-hot topic of small-world networks is introduced as an area of great potential, especially for several themes developed in this book. Small-world networks also offer a structural perspective in parallel to other existing perspectives such as quantitative studies of social networks.